Musty odors or suspicious spore growth in your National Park, NJ home or business can be signs indicating bigger, underlying issues like major water damage and mold. An indoor mold contamination can put you, your family, and your property under serious distress. Mold exposure can lead to various health implications. The water conditions promoting the mold development means serious property damage and structural deterioration to the building. If a mold problem is not properly addressed, the problem will only worsen and create more problems further down the line. If you suspect a potential mold problem in your home or business, you should contact a certified mold professional in NJ. A trained and certified mold inspector will be able to properly and accurately assess your situation, determine the full extend of the problem, and prescribe an appropriate solution to your specific needs. Each MasterTech mold inspector is equipped with moisture meters, thermal imaging readers, and the proper training and knowledge to thoroughly complete a mold inspection of your National Park, NJ Home. Through a visual assessment to identify the immediate concern, moisture mapping and thermal imaging to diagnose the causation, and collecting of samples for scientific analysis, a trained inspector will be able to evaluate the full extent of the mold contamination and draft a mold removal solution tailored to your specific mold needs. recommendations for preventative measures that ensure moisture control to avoid mold recurrence. Our team of industry certified mold removal experts have made every effort to strategically incorporate the safest and most effective mold removal methods, products and equipment into our step-by-step mold remediation process. As proof of our commitment to providing the highest quality of mold remediation services possible, our mold remediations are backed by a 5-year mold removal warranty. It is our promise that the mold has been effectively removed, and it will not return. At MasterTech, we have developed a step-by-step mold removal process that is safe, effective, and efficient for your National Park, NJ home. Our remediation process integrates the safest and most up-to-date methods and tools so we can be confident that the job is done right the first time. Additionally, each technician on our mold remediation team is specially trained in safety and quality assurance. Containment: Barriers are placed to isolate contaminated areas and prevent cross-contamination. Air Filtration: HEPA-filtered air filtration devices maintain safe indoor air quality. HEPA Vacuum: We use HEPA-vacuums to remove all surface mold from affected building materials. Demolition & Removal: We will carefully remove and dispose all non-salvageable materials. Mold Root Removal: A concentrated hydrogen peroxide agent will be used to remove mold roots. Re-HEPA Vacuum: Another round of HEPA-vacuuming is completed to remove any remaining mold. Mold-Proof Coating: Mold-resistant coating is applied to cleaned surfaces to aid prevention. As a demonstration of our commitment to getting the job done right the first time, each MasterTech mold remediation in National Park, NJ is backed by a 5-year mold-free warranty. It is our promise to you that the mold is gone, and it will not come back. REMOVAL is the only safe and effective approach to mold. Be careful not to mistake mold “treatment” for mold removal. Mold removal is the active removal of mold roots that are deeply embedded within porous building materials. Mold “treatment” is merely a temporary bandage for the foreseeable symptoms of a bigger problem. If your mold problem is not actively removed properly, even if the mold grows dormant and seemingly “dead” or “gone”, the mold will inevitably grow back. Unfortunately, it is commonplace for mold “professionals” to claim that they can “treat” the mold with one application of this chemical or with one coat of this kind of paint. So take some time to do your research and do not be shy about asking a lot of questions. 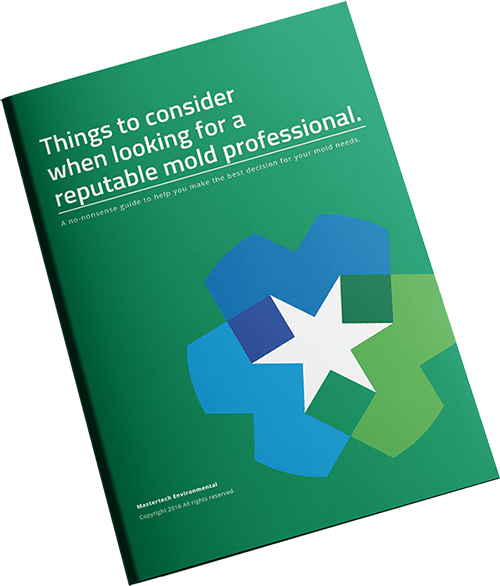 Taking the time to find a trustworthy and reputable company will help to avoid falling for some embellished mold “treatment” pitch that seems too good to be true. Concerned about unexplained musty odors or suspicious spore growth in your New Jersey home or business? Call MasterTech today to schedule a Gloucester County, NJ mold inspection with on of our certified mold inspectors. For a mold inspection or mold removal in South Harrison, NJ or for a mold inspection or mold removal in Glassboro, NJ, call 1-800-310-3226.